Home » Household » Household Tips » Tips for getting organized in the new year! Happy New Year! January is here so it’s time to get organized! Here is a round-up of some fantastic ideas to get your space in shape fast! A pants hanger – really?! This is a brilliant way to corral ribbon spools shared by Creating Keepsake blog. Need more storage space in the garage? 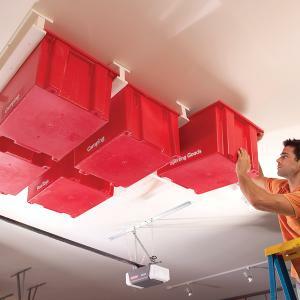 Check out this tutorial from The Family Handyman on creating storage on the garage ceiling. Fantastic! 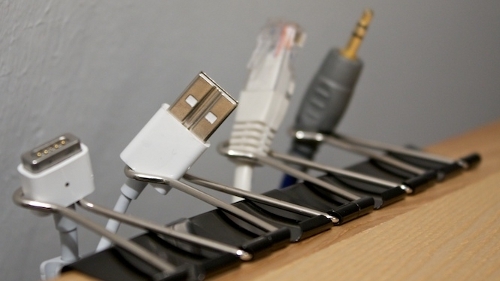 Lifehacker has a great idea to manage all of those cables under your desk using binder clips! 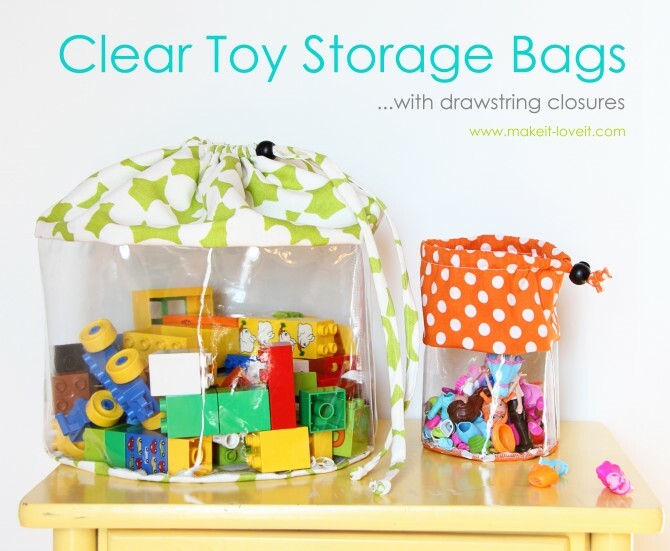 If you have millions of toy pieces and parts, you will love these clear vinyl bags from Make It-Love It. Take a look at the great tutorial. Genius! Store curling irons out of sight with PVC pipe holders! Want to find even more fun idea’s? Are you on pinterest? Come find me there. Fantastic ideas I must take a leaf out of your book and get myself organised. Thanks for sharing. I have seen some of these ideas on Pinterest the other day. Love the one about the totes being stored on top of the garage ceiling. Showed it to hubby and he loved the idea too. Once we get the garage more organized from the move in, we will be doing that same thing. I have some PVC pipe here at home and will be doing the curling iron storage idea for my daughters bathroom. This way they can find what they need, its not out on the counter all the time, Safely put away from my 2yo grandsons hands. And when guest come over to use the bathroom their stuff is not all over the counters. I am going to be doing one for their brushes too. already to the one for the different cords that clog up space on your desk from the computer, printer, and what ever other gadget you might have plugged in. now I know what to do with all the clear bags I have floating around other than quilt projects, and blocks that are cut out and ready to go. Can store my grandson's toys in them when he is not here visiting. Even put his name on them so he feels special and knows those are his to play with. Great to store the bathtub toys in too and place under the sink and out of the way. Any idea on how to keep the yarns organized?for the time being I keep them in the rice container..
Love all these ideas. Especially the ribbon holder and the vinyl bag holder. Great for legos!!! Love these ideas, always want to start January with fresh organization. Somehow, it makes me feel more capable of facing another whole year. I love the pants hanger idea! Thanks so much for sharing! I am starting the CSI Project Forum today so crafters can gather and talk. You can get support there as we talk about our goals for 2012. Come by and register. It is FREE! I would love it if you would share with your readers too!!! The first 50 people to register could win giveaways from our forum sponsors.